As your wedding day draws nearer, and you’re finalizing the last-minute details, we want to address 10 small touches that boost guest comfort and leisure. 1. For those hot summer days: Some of the most common complaints guests have are related to weather conditions. 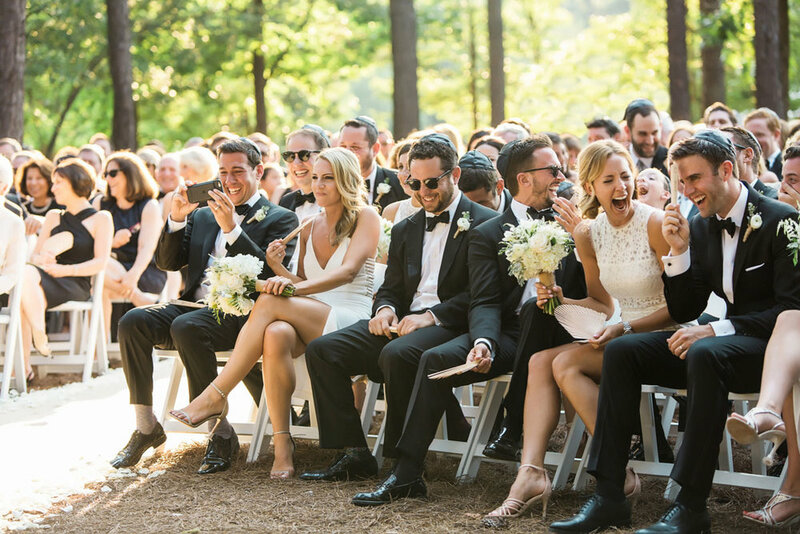 Since a majority of weddings are in the spring and summer months, it’s important to have items on hand that can compensate for the potential overly hot weather.Fans, and even sunglasses, sunscreen or umbrellas are helpful amenities to include-your guests will appreciate them! 2. Pre-ceremony drinks: As guests are arriving and before the festivities start, feel free to offer refreshers to cool down like sparkling water or iced tea. 3. For those chilly nights: If you’re having an outdoor wedding in the spring or fall, you’ll most likely need to accommodate relatively chilly weather, or at least plan for it. Having baskets of blankets or pashminas set outside is a nice way to make sure guests remain comfortable throughout the night. Check to see if your venue has space heaters, as these might come in handy too. 4. Amenities: A bathroom amenity basket is a useful and much appreciated gesture. Including items like tissues, bobby pins, lotion, hairspray, Advil, etc. is a great way to make sure guests have what they need. 5. For the kids: If you know there are going to be kids at your wedding, you might consider having a specific area with a crafts and games available. 6. Shoes: As the night goes on and the high heels come off, it’s nice to have flip flops near the dance floor for guests to use. Just a little something extra to optimize comfort and to make sure everyone keeps dancing! 7. Seating arrangements: Planning the seating chart effectively can be a good way to accommodate elderly guests. While your friends want to drink and dance, older guests will most likely want to catch up and talk with others in a quieter place. Try to assign those seats in a way that will be pleasing to both groups of guests. 8. Other entertainment: When your guests feel they need a break from dancing, have other forms of entertainment available, such as a photo booth, lawn games, etc. 9. Welcome bags are another nice gesture to offer your guests. These can essentially include anything you want, but most often they contain practical things to use throughout the day, such as snacks, mini water bottles, mints, and items needed for weather conditions (sunglasses, sunscreen, etc.). Feel free to include a little something that represents you as a couple- get creative! People will enjoy remembering your special day with a souvenir. 10. Late night snacks are very much appreciated by guests, since quite some time has passed since dinner, and all the dancing has worked up an appetite.